Did You Know? Your donation of $50 will purchase a uniform for one child. 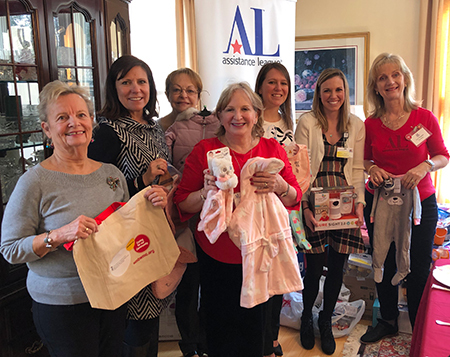 In 2017-2018 Assistance League of the Chesapeake provided 2,560 new school uniforms for 2,000 students in six Title I elementary schools and one middle school in Anne Arundel County. We are on target to provide to do the same in 2018-2019. 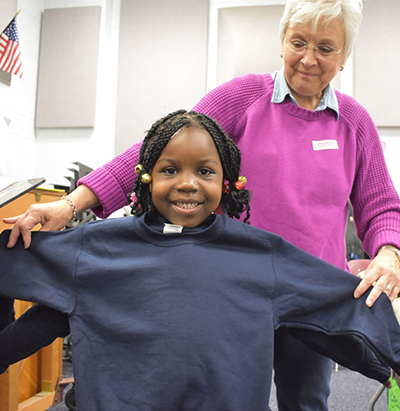 Since 2012, we have provided over 10,000 uniforms to in-need students in our county. 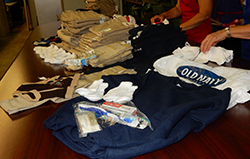 The uniform package consists of a navy blue shirt, khaki pants, navy blue crew neck sweatshirt, socks and underwear. In addition, each student receives a bag of toiletries which includes a toothbrush, toothpaste, soap, shampoo and conditioner. The toiletries are collected all year at our chapter meetings and are donated by members and members’ dentists. Most students receive one uniform set and some receive two, depending on their need. Our volunteers staff a monthly Guest Reader program, tutor children, work in classrooms, sponsor literacy-based enrichment programs, donate books to students, and organize several enrichment activities that promote positive behaviors for an effective learning environment. In 2016-2017, the program reached more than 7,500 students. Assistance League makes sure every child in the schools we serve receives a book of their own to take home and share with their families. Did You Know? 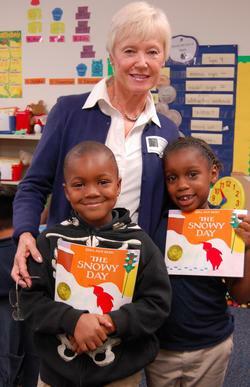 Your donation of $80 can provide books for an entire classroom. 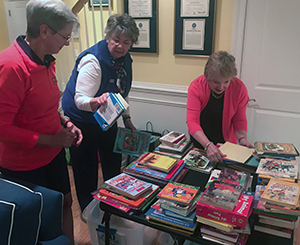 During “Make A Difference Day,” Assistance League collects books to distribute to numerous Title I schools in the county. 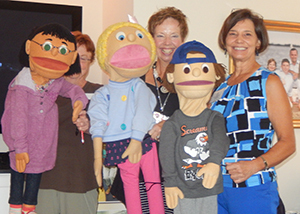 Our volunteers and their life-size puppets visit elementary school classrooms throughout the county to talk with students about cultural differences, bullying, and learning differences. The targeted scripts help children accept individual differences and learn valuable social skills. 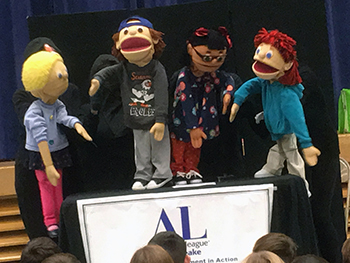 Our puppet troupe visits about 13 school each year, from October through April. 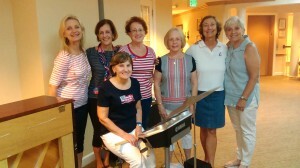 Members donate over 800 volunteer hours per year in this program. Meet our puppets: Eddie is being bullied by a nasty boy in school, but learns to deal with the boy in a positive way, thanks to his friend Claire. Claire is smart, kind, and has a wisdom way beyond her age. She counsels Eddie to do positive things when being bullied: tell a teacher, stand by a friend who is being bullied, and work together to raise awareness of the problem. Jennifer is a rough and ready little girl with a learning difference. She can sing, dance, and play soccer. She gets straight A’s in math, but has an issue with reading and writing. Brenda is a little overweight but very sensitive to being bullied about how she looks. Jennifer helps her learn to ignore the bad remarks and like show she is. Melody is a smart and sassy girl who does well in school and offers to help Jennifer with her school work. The children in the audience come to identify with the puppets and open up to them as if they were trusted friends. Students are encouraged to accept physical, social, medical, and cultural differences, and are empowered to tell an adult about any perceived bullying. 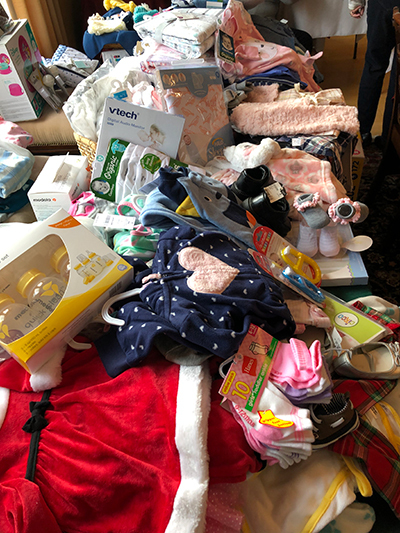 Through this program, members of Assistance League contribute items for expectant mothers to the Stork’s Nest Baby Shower redemption store at the Baltimore-Washington Medical Center. This initiative is part of the Center’s prenatal health-initiatives program for underserved women. At right, Assistance League members and Stork’s Nest representatives at this year’s baby shower. Read more about the event. 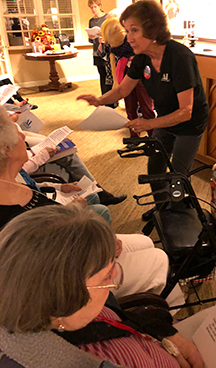 An interactive Sing-Along program allows senior citizens in assisted living and nursing residences to enjoy the songs they remember from their youth. Assistance League members provide the music, song sheets, encouragement, and companionship.